Star Trek: 50 Artists 50 Years Review – AiPT! I was once told you’re either a Star Trek guy or a Star Wars guy. I then proceeded to defend Star Trek until I and the incredibly wrong Star Wars fanatic were beet-red with anger. I argued eight hours of Star Wars (this was just after The Phantom Menace hit theaters) cannot compare to the hundreds of hours of philosophical Star Trek, a show that for all intents and purposes said more about humanity that Star Wars ever could. But I digress–debates like that hold no winner. The 50th anniversary of Star Trek is here and it’s time to celebrate and what better way to do that than with this week’s release by Titan Books? 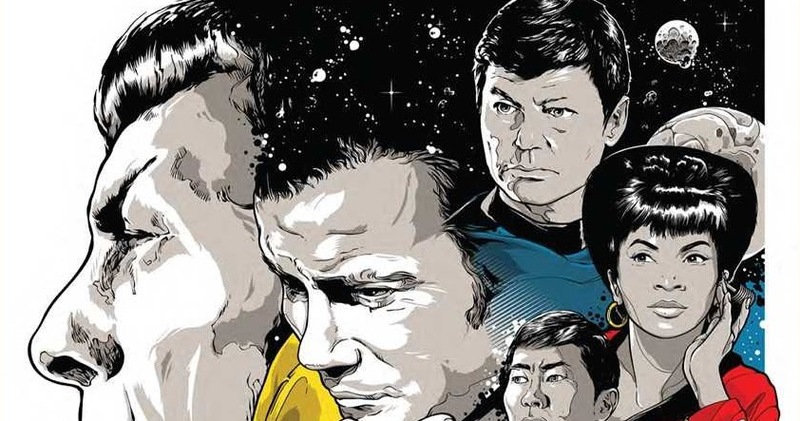 You can also check out some of the art with interviews on the official Star Trek site. This book not only collects 50 gorgeous pieces of art in an oversized hardcover specially commissioned for this book, but also interviews with each artist. These interviews reveal how each piece was made, why they are artists and why they love Star Trek. It’s the perfect way to honor the series visually and get at why the series is so great straight from the minds of those who love it enough to honor it with their craft. Not every work of art in this book is a painting! This one is by Calvin Ma. Find more work by him here. Forgive me for saying this, but this book is out of this world. The larger format is the perfect size for much of the art within as it allows the finer detail to be seen, but also gives each piece more room to be enjoyed. Typically each artist gets a page for the art and another page to answer questions, which puts the focus on each artist specifically as if they are exhibiting their art personally to you. There isn’t a bad piece in this book either and while some might not be everyone’s cup of tea that’s part of the beauty of this book. There’s something for everyone within, from pop style graphic art, to models, to a piece made by sewing long lines across a black tapestry. The type of art is quite eclectic, which makes for a more robust and fulfilling series of interviews too. Joshua Budich’s excellent poster. More art can be seen by him on his website. The interviews don’t disappoint either. While some run short, you get a sense for the people who made these works because of the questions asked. Nearly every interview has the same few questions (What is your favorite Star Trek series, why do you create art), but most have a unique question due to the responses from the artists. If you’re an artist of any kind, you owe it to yourself to purchase this book. Most of these interviews go into the materials, the size of the work, the time it took to create the art, or just what inspired them to do it. Page after page I found myself reading interesting answers that revealed something about the artist or the art itself that was genuine and compelling. Many of the artists exhibited in this book have been in the industry for ages which makes their thoughts on art and their work all the more fascinating as well. While I wasn’t familiar with most of the artists in this book (save for a few like comic book artist Ulises Farinas) there’s a handy paragraph detailing who each artist is and their accomplishments. A piece by Ulises Farinas. You can find more work by him on his website. Much of the art is quite modern which adds a bit to the nostalgia some of the artists exhibit in their creations. Even the works that attempt to depict throwback style posters have a modern feel. Considering many of the works in this book are about the original series, the modern looks give Star Trek a retro feel. Fans of Deep Space Nine, Voyager, and Enterprise might feel a bit disappointed as none of these are represented much if at all in this book. The focus is primarily on the original series with a handful of Next Generation pieces. By my count six of the 50 focus solely on Next Generation with a few more working the cast and crew into their pieces in big collage pieces. That leaves 44 solely focused on the original crew and starship. Still, every piece embodies the spirit and love of Star Trek. A sickly Borg work by Dan Mumford. More art by him on his website. This book is gorgeous in every way. If you love Star Trek or at the very least have enjoyed its message you owe yourself the pleasure of reading this book. Artists interested in the craft should also check this book out.